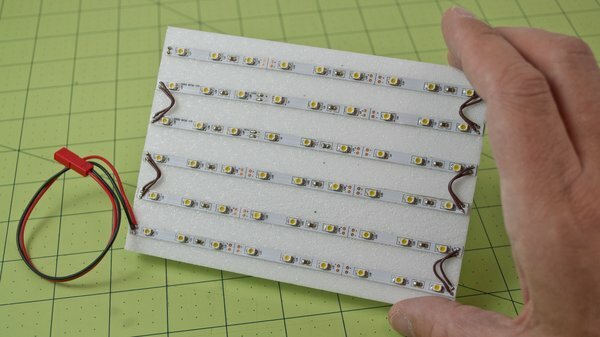 Terry shows you how to make a simple work lamp out of LED light strips and foamboard. I recently decided that I needed a practical work lamp. The overhead lighting in my workshop is adequate most of the time, but not always. My ideal lamp is something I can place near my workspace and orient in different ways. I experimented with some desk lamps and battery-powered portable lights. However, all of the units that I tried produced overly-harsh light that created glare and strong shadows. Some were also limited by insufficient positioning options and the constraint of being tethered to a power cord. There may be a suitable commercial unit out there, but I decided to take the DIY approach instead. I was inspired by a friend's light board that he created using LED light strips attached to foamboard. He uses his contraption for studio lighting when shooting photos and videos. Since it runs off of a common 3-cell LiPo battery for RC models, he can take it anywhere. I created a downsized adaptation of this idea that works well for my needs. The foundation of this project is a light strip that is populated with white LED lights. There are many types available. Most are about 3/16" wide and can be purchased in various lengths. There is a junction between every third light (approximately every 2") where the strip can be cut to the desired length. 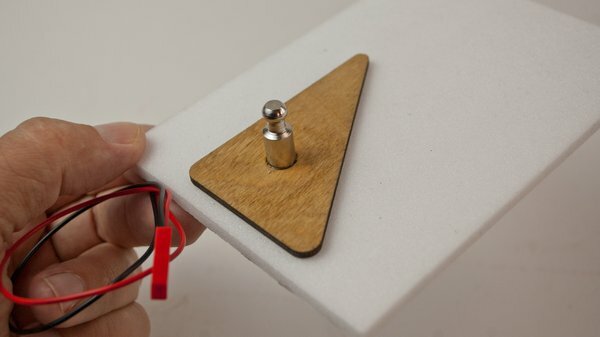 Integrated solder pads make it easy to wire up a 12-volt power source and connect multiple strips in parallel. 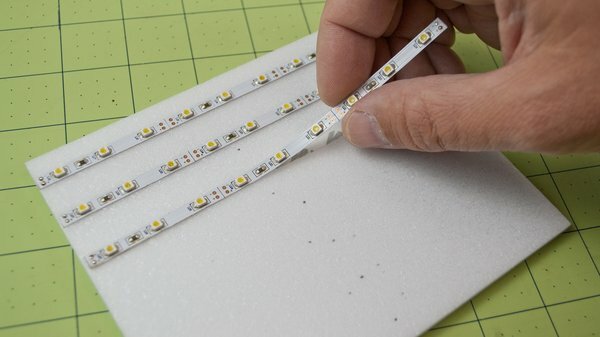 Step 1: Cut the LED strip into six sections, each about 6" (152mm) long (3 of the 3-LED segments). Step 2: Attach the LED strips to the board with relatively equal spacing. My board is a 4" x 6" (102mm x 152mm) piece of 5mm-thick foam sheet. Standard foamboard would probably work better, but this is what I had available at the time. The adhesive backing on the strips isn't very tenacious so I tacked them down with dabs of white glue here and there. 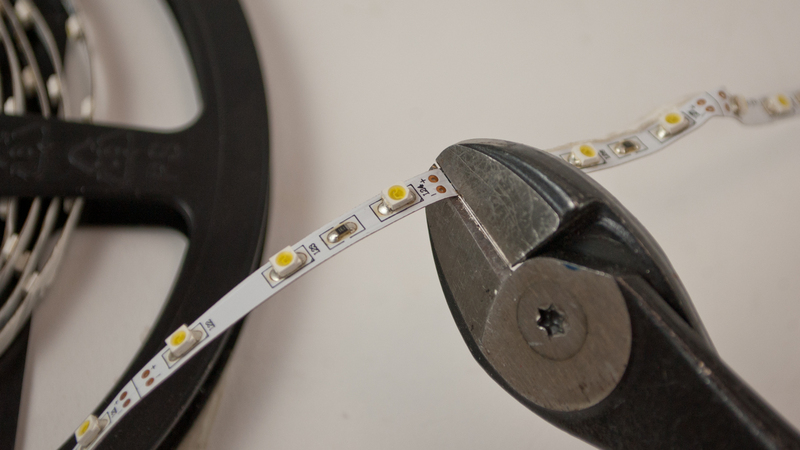 Adhere your light strips to the mounting board at evenly-spaced intervals. Step 3: Connect the six strips electrically. I soldered short lengths of 26-gauge wire to the end solder pads of each strip. I also added a pigtail with a JST plug to connect to my battery. Pay attention to polarity! Solder electrical connections to the lights using the integrated solder pads. Step 4: Insulate the solder joints. You wouldn't want a random screwdriver rolling up against the light to cause a short. I insulated the joints by covering them with white glue. Insulate exposed electrical joints. I used white glue. 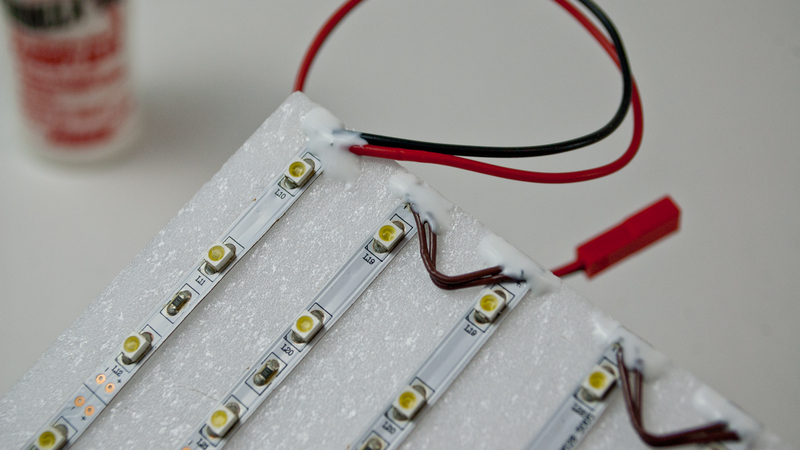 Step 5: At this point, you could plug in a 3-cell LiPo battery (12.6v when fully-charged) and have a functioning light. But you really need an articulating base to make the light more functional. That's where the "3rd Hand" assembly comes in. Remove the parts that you don't need. 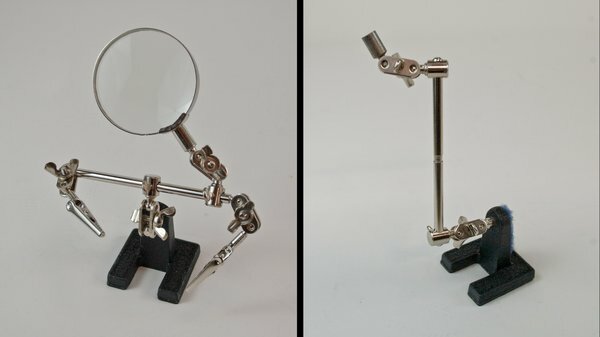 Magnifying glass? Gone. The alligator clips should meet a similar fate. I rearranged the remaining pieces to create a single arm with two joints. At the end of the arm is the ball stud that was previously used for the magnifying glass. Modify a common 3rd hand assembly to have a long arm with two articulating joints. Step 6: Glue the base of the ball stud to some sort of doubler. Another small piece of foamboard should work fine. I used a piece of scrap 1/8"-thick (3.2mm) plywood. 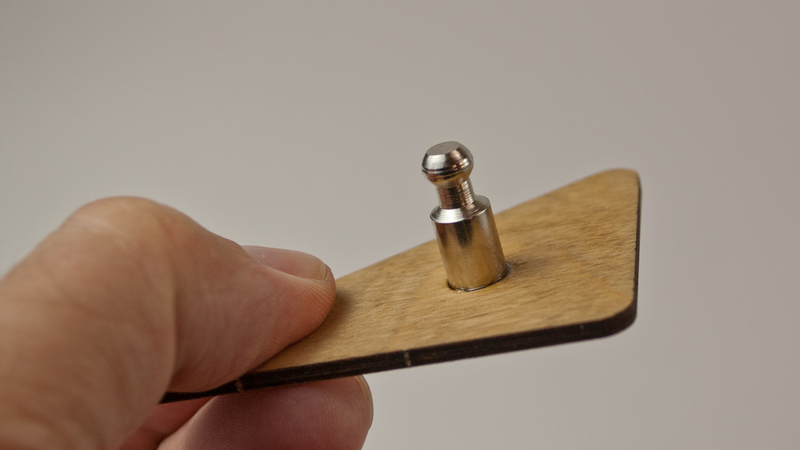 Glue a ball stud (taken from the 3rd Hand magnifying glass) to a doubler. I used scrap 1/8" plywood. Step 7: Glue the doubler to the back of the light board. I used foam-safe cyanoacrylate (CA) for this bond. I think that you get more positioning options by placing the doubler near one end of the light board rather than the center. The completed assembly has a wide range of motion and many possible configurations. 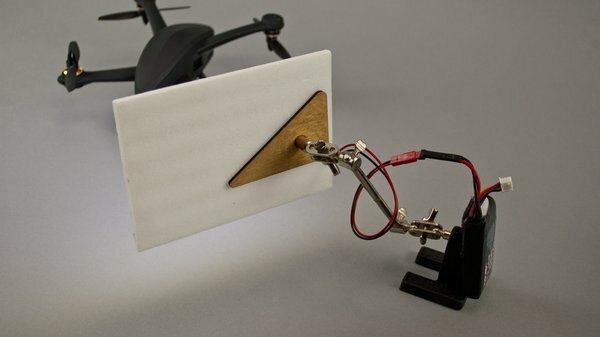 Adhere the doubler to the backside of the light board with foam-safe adhesive. Step 8: Attach the battery to the base of the lamp using adhesive-backed Velcro. Your lamp is complete! Just plug in the battery to turn it on. My light is powered by a 3-cell 950mAh LiPo. Total current draw of the lights is about 250mA. So I should theoretically get between 3 and 4 hours of usage with each charge. However, I typically only need to use it for a few minutes at a time. I just recharge the battery every few weeks. 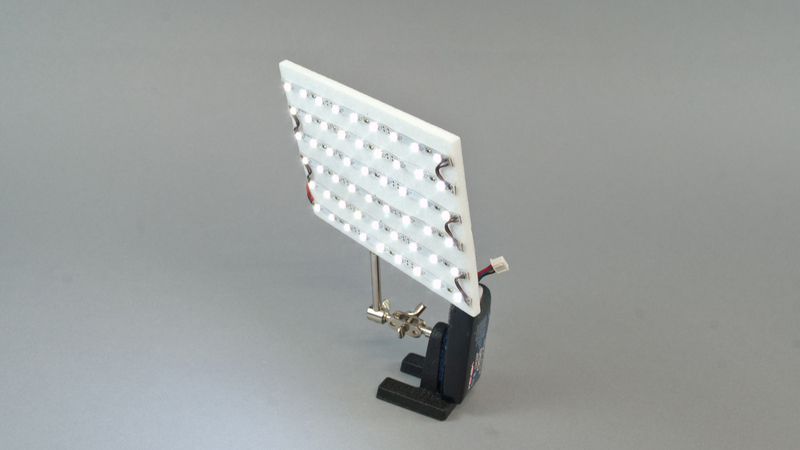 The completed lamp is a portable, articulating light source that does not create harsh shadows or glare. One thing to keep in mind is that there is no low-voltage protection in this setup. If you accidentally leave the battery plugged in, you could over-discharge the LiPo and kill it. Using a small, inexpensive voltage alarm plugged into the battery's balance plug will help mitigate that risk. Those who are uncomfortable with LiPo batteries could choose to use 18650 Li-Ion cells or an AC/DC power supply instead. You have options. The lamp is not terribly bright, but that's what I was looking for. Since the light sources are widely-dispersed, I can place the lamp very near my work area and not have harsh shadows. I also do not have any problems with the lights creating glare. 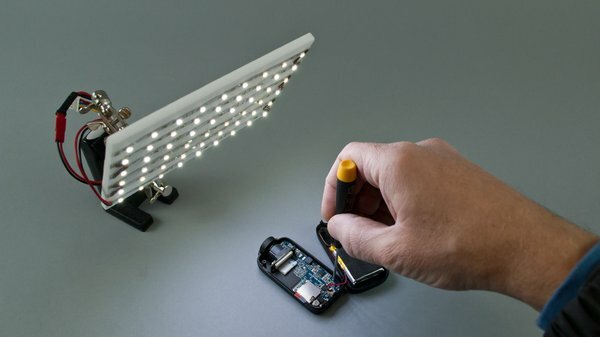 The work lamp can also be used for fill light when shooting photographs. I originally built the work lamp to help illuminate small areas when I'm hunched over the workbench (blocking the overhead lights). I'm finding out that it has other uses as well. I often use it for fill light when shooting photos of my projects. I even had it under the kitchen sink while replacing a broken faucet. It is proving to be a handy tool. 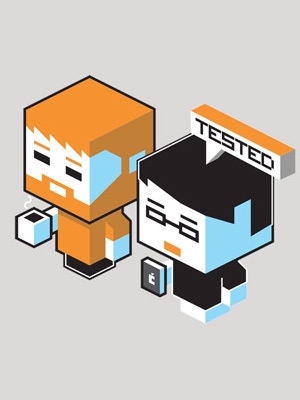 Obviously, this project is scalable to suit whatever purpose you have in mind. You can increase the size of the light board and tack on more lights if you wish. If you build (or have built) a similar light for yourself, please share details in the comments section. Terry is a freelance writer living in Buffalo, NY. Visit his website at TerryDunn.org and follow him on Twitter and Facebook. You can also hear Terry talk about RC hobbies as one of the hosts of the RC Roundtable podcast.